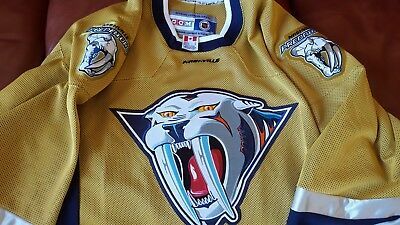 The most unimaginative jersey in the history of hockey. Black with dust on the sleeves. Wow. If there was an art class and the assignment was to create a new hockey sweater and I handed this in, I would get an F for uncreativity. Just a quick paycheck for the boys in the office. This is just unbelievably awful. I’m convinced someone made a bet saying “I bet I’ll throw in nothing and they’ll accept the jersey” and BOOM! They actually got away with it. I like it, they tried something different. Not every hockey sweater needs stripes, piping and/or yokes. I think the simplistic design will sell well with non-traditional fans. They’re not what I expected at all, but it’s an alternate. I’d rather see them test the waters on an alt with some elements than ruin a solid home and road set. The Lightning have been consistently disappointing with their jersey designs for a pretty long time, so I had no real expectations for this. I guess its fine since its just a third. I like when third jerseys are somewhat of a departure from the main set. Not great execution here, maybe give it a 5.5/10. But in a weird way, i think it actually excites me more than all of the throwback retreads we got for third jerseys from the rest of the league. What did we get like 4 new alternate designs all season? The Lightning should be forced to forfeit the rest of the season. Yuck. So the Lightning players are starting to evaporate from the Thanos snap? Yeah, and the Penguins & Bruins should really do something about their radioactive-cat-pee trim. Reaugh needs psychological help. Perhaps a get-well card, maybe? Seeing those Tampa jerseys in action, it’s pretty hard to even discern who is who with those grey outline numbers. I don’t think these uniforms have any redeeming qualities. It looks like Adidas put a bunch of bells and whistles on a uniform they forgot to design. On the ice it looks like a continuous-grey, indiscernible mess. Since the Lightning's primaries resemble the Red Wings, maybe they should also follow their footsteps in not having an alternate jersey. Every one they've had has been bad. The best was in 2008 and even then it wasn't that great with the nickname wordmark and trim going to nowhere. Who honestly thought these were a good idea? Can't even read the damn numbers on TV. Well at least the hockey gods struck them down with a (Bettman) loss in the debut? Since the Lightning's primaries resemble the Red Wings, maybe they should﻿﻿﻿ also follow their footsteps in not having an alternate jersey﻿﻿﻿. Maybe this is why Yzerman left? I wouldn't blame him. Their original yellow alts from the 2000's were definitely cat urine colored...thats for sure. That mesh overlaying the blue just never looked right. The jersey is taking a swing at something and I don't think it particularly succeeds with the whole thing being too dark. My biggest issue is the number on the back. When has dark colored numbers placed on a jersey of the same color as the number ever looked good? It's not as legible, it doesn't look as good as a single color number would have, it's clunkier and heavier looking. They had to start that game with a 2 minute penalty. Tampa's isn't as bad as that because the outline is much thicker, but I still don't think it looks good. It pains me to say it, but this could use some electric blue(preferably) or volt. It's all night and no lightning as is. Just watched the highlights. In game the sleeve effect gets lost, which is pretty much what I expected. They're boring, but "practice jersey" isn't what I'd call them. They almost look like a rec league team that just started out and could only afford basic black equipment.